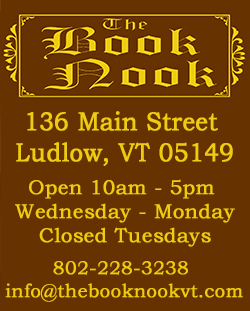 We our located at 136 Main Street in Ludlow, Vermont. 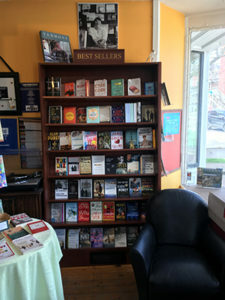 Established in 2006, our small shop specializes in primarily new books, but we do have a small selection of discounted books (remainders and used). 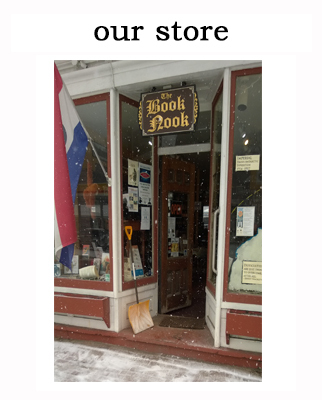 We offer a fine selection of the latest hardcovers, bestselling paperback and books by Vermonters and about Vermont. We have shelves dedicated to history, non-fiction, literature, drama and poetry, fiction, humor, mysteries and thrillers, science fiction and fantasy, crossword puzzles and other gaming books. We also offer a selection of children’s books that range from board books to young adults and everything in between. We have cards, bookmarks, journals, dayplanners and calendars too! Every book in the shop is hand selected by our small staff. However, if there is book you are looking for that we do not have in stock we can special order it for you (usually in a matter days). We offer gift certificates for all occasions and any amount. They can customized with TO and FROM information. We offer a free basic wrapping – the book is loosely enclosed in tissue, placed in one our paper bags and then several pieces of tissue are poofed out of the top of the bag. We have tables and chairs where you can sit and read books. And we offer free Wi-Fi in the store (ask at the counter for the password).